My dear Readers and Bloggers, it makes me happy to see many of you read my blog. If you think that others would benefit from the reading the same, then please do share. This afternoon, I was listening to the radio and the topic was – ‘No, to Violence in the Family.’ The Family is supposed to be a Haven for all its members and when a family becomes Hell to its members, then it should be a No, No. Marriage is not between two people, it is between three – God is the First person and the the Bride and Bridegroom. The Holy Spirit is the UNITING FACTOR. Without the Holy Spirit, Marriages become a burden and they break. So, it is vital for us to invite the Holy Spirit into our Marriage. Why do couples get married? Why do couples co-habitate? This is something that all couples should dwell on. Spend some time and think…… Every individual is seeking peace and when individuals get married, they surrender themselves and their independence to the other. What do you think they are saying to each other before they get married – “I give myself to you. I trust that you will love me and take care of me forever.’ But somewhere along the way, some couples forget the love that they had for each other, when difficulties and problems come knocking on their door. Life is not meant to be easy. Difficulties and Problems are part and parcel of life. 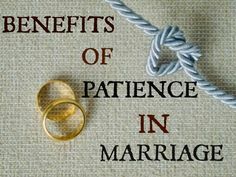 What each married couple should remember is – that marriage is not for a day or two – it is for a life time. It is a commitment. Couples should remember that it is important to put in a lot of effort into their marriage and to work towards PEACE AND HARMONY. UNITED WE STAND – DIVIDED WE FALL. So, families – STAY UNITED!